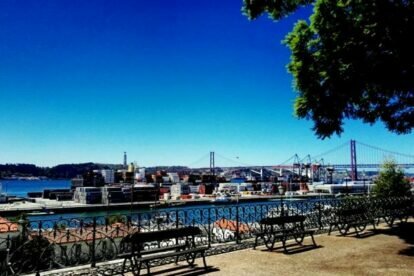 Another good excuse for a cultural tour in Lisbon: escape the tourist route and let the magic of this lesser-known place take care of itself: the viewpoint of Rocha de Conde de Óbidos, which is located in front of the port and next to the National Museum of Ancient Art. In addition to the cultural part, this belvedere is surrounded by a diverse fauna and flora that contrasts, with its purest nature, with the set of harmonious buildings that surround it. Highlights include the National Museum of Ancient Art and the Óbidos-Sabugal Palace – now the National Headquarters of the Portuguese Red Cross. The viewpoint of Rocha de Conde de Óbidos conquers and pleases with its simplicity and the view over the commercial area of the port and the Tagus River, the 25 de Abril Bridge and Cristo Rei. For me, without a doubt, the highlight of the visit is the fact that this viewpoint is the best place to photograph the Tagus and the bustle at Cais da Rocha do Conde de Óbidos, especially in the late afternoon, when the sun sets at the highest point of Almada. And of course you can go to the National Museum of Ancient Art after staying a bit in this wonderful garden.